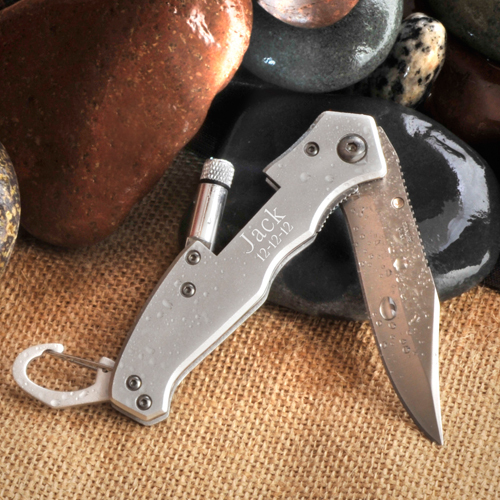 * Compact yet sturdy, our personalized Klondike Lockback Knife is the ideal gift for your favorite angler or hunter. * Sporting a brushed silver-tone finish, this personalized locking knife includes a handy flashlight for those after dark adventures or any other time you need a little extra light. * With a built-in belt clip, the engraved knife is always within reach. * Measures 4" closed and 7" open. * Handle is 1 1/4" x 3/8". 7" x 1.25" x 0.375"